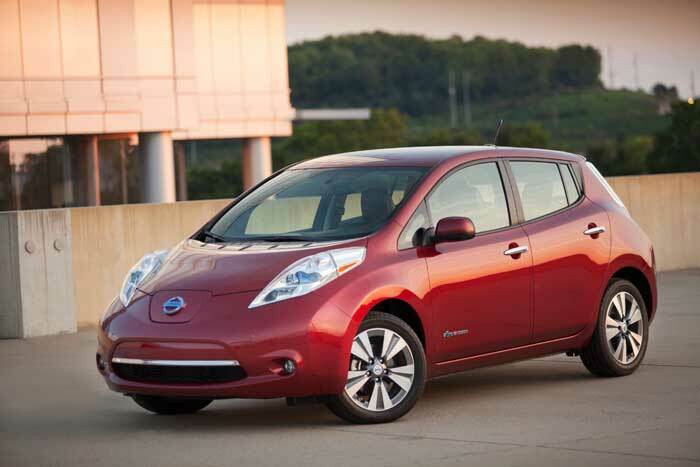 For 2013 Nissan made one big change to the Leaf. They lowered its price. A lot. Nissan accomplished this monetary miracle by moving production of the Leaf to the United States and by adding a new, stripped down version, the “S”, to the model lineup. So whats the S like? Mostly boring. But boring can be good. The Leaf S is in every way predictable. The speedometer is easy to read. The major controls are easy to find – admittedly the gear shift is unusually shaped, but it is easy to find. The Leaf’s ride, while not exciting, is solid and reassuring. Acceleration isn’t strong, but it’s better than a Prius. It seats five and gets around a hundred miles a charge. Best of all, it’s affordably priced. The S model Leaf starts at $28,800 before the $7,500 Federal tax credit. My first impression when driving the Leaf wasn’t very positive. The interior is very plain, the ride uninspiring, acceleration so-so. It wasn’t until I started writing this that I realized just how much Nissan has accomplished with the S and what a really amazing value it is. Like any electric car the first thing you’ll notice is there is no engine noise. Compared to a Chevy Volt, the Leaf seemed a little noisy but still very quiet when compared to anything but another electric car. The main difference between the Leaf and the Volt seemed to be tire noise, it’s a little better suppressed in the Volt – which considering the Volt costs about $5,400 more is to be expected. 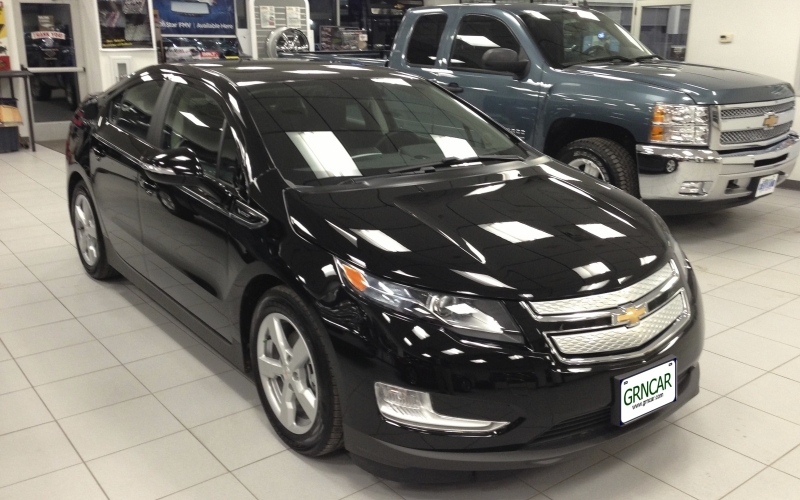 While the Leaf isn’t as much fun to drive as a Volt – the Volt has a lower center of gravity and stronger acceleration – the Leaf provides much better driver visibility. Overall the Leaf compares very well to a Toyota Prius. The Leaf accelerates better than a Prius and has much better visibility. The Leaf’s seats are at least as comfortable as those of the Prius and the cabin seems more spacious. One advantage for the Prius is its much larger cargo compartment. Nissan had to find space for the battery pack and they found it in the rear. One of the things I liked best about the Leaf is it’s dashboard layout. Unlike the Volt or the Prius, the Leaf’s readouts are uncluttered and easy to read. They don’t overwhelm you with information, they give you just what you need. It’s easy to see exactly how fast your traveling and especially easy to see how much battery charge you have remaining. 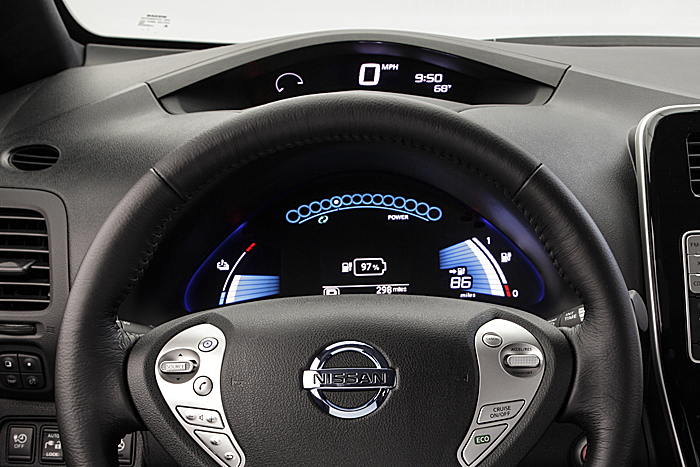 The Leaf’s dashboard is well organized and the major gauges easy to read. The biggest drawback of the Leaf S is its interior. It is really plain and loaded with black plastic. The seats are just standard cloth, they’re not made of any special biodegradable fabric (unless you buy the Leaf SV). They are just standard seats. They’re comfortable, but not as comfortable as the ones in the Nissan cube, and they don’t have as much side support as the seats in the Juke. Still, they are heated (both front and rear) which means a lot on a cold winter day. 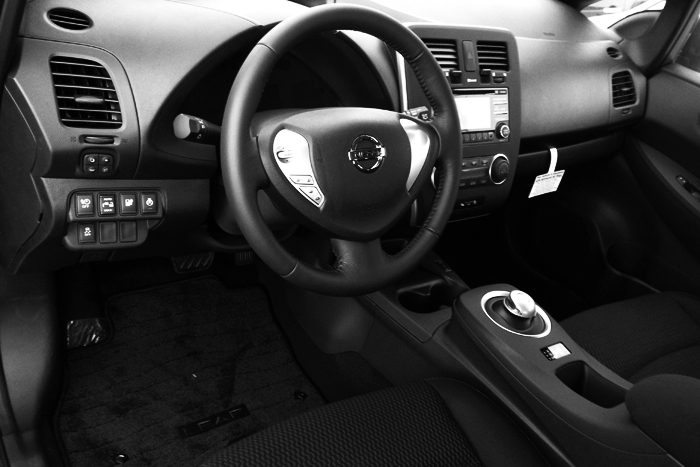 The Leaf S features a lot of black plastic plus black upholstery. There is one thing I liked about the Leaf S interior – the heated steering wheel. A heated steering wheel is one of those little things that I never missed until I drove a car that had one. Now I wish my car had one. The exterior mirrors are also heated, which is convenient. 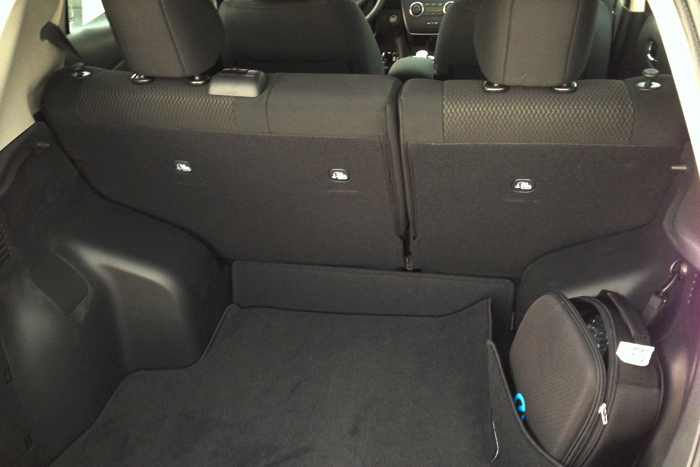 The rear cargo area is fairly small and oddly shaped, but the rear seats can be folded down. The Leaf S, although stripped down with compared to the other Leaf versions, is still pretty well equipped. In addition to the standard heated seats and steering wheel, the S also has automatic temperature control, a smart key with a charge port door release button and Bluetooth, all standard. The Leaf S radio is pretty basic – AM/FM/CD with a USB port for an iPod or flash drive. It only has 4 speakers so the sound quality is average at best. If you plan on buying a Leaf, as opposed to leasing it, three or four hundred dollars will get you a decent set of aftermarket speakers which could make owning the S model much more pleasant. The Leaf S also comes with a 3-month trial subscription to SiriusXM satellite radio – and the privilege of receiving weekly mail from SiriusXM if you ever let the subscription lapse. As stated earlier, the good thing about the S is it’s low price, the bad thing is that because it’s a base model you don’t have many options. Actually, there is only one option and it is pretty much mandatory – and it costs $1,300. The option is the Charge Package and it adds two items: a 6.6 kilowatt charge port and a rearview camera. The 6.6kW charge port allows you to use a commercial power station which can charge your Leaf in about 4 hours instead of eight. The rearview camera is almost a necessity. And, last of all, you better like black upholstery because if you want a different color you’ll have to move up to the Leaf SV. Overall the Leaf S is a decent little car. It seats 5, has great visibility and is easy to get in and out of and it is very quiet. 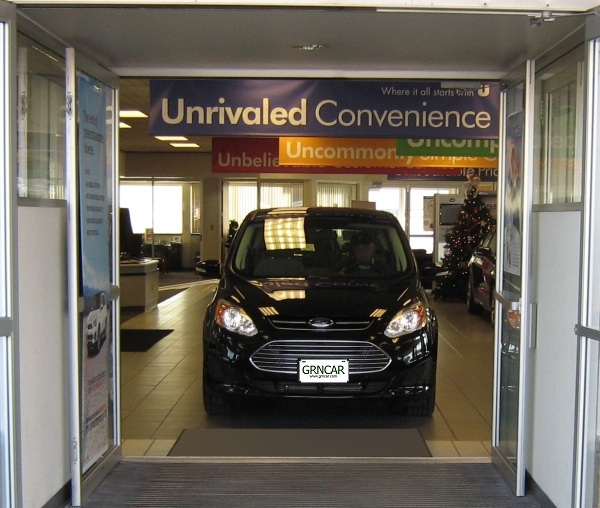 The cargo area is small and oddly shaped but good enough for groceries and the Leaf gets close to 100 miles per charge. The best thing about the S model is, after the Federal tax credit, its a good value, one that compares very favorably not only with other electric cars but with almost any car.